"Welcome to the Magic Bus, the bus that cares." Auckland may be nice but it bears a striking resemblance to a U.S. city with a similar sounding name. Oakland. That's not the only similarity, however. As Gertrude Stein once said of the California city, "There's no there there." Auckland is a city like any other, and seems to have no characteristics that distinguish it from any other fairly clean city in any other country in the world. Unless you count the people rappelling off the side of one of the city's tallest hotels -- face-first, that is -- but that's fairly typical of New Zealand. An island nation filled with people constantly looking for new ways to hurtle themselves at the earth at high rates of speed, and hoping they miss. After having spent half a week wandering Auckland's streets, buying all the things I forgot to get before I left the States and getting accustomed to the fact that I wasn't in Kansas any more, I realized I had seen all the city had to offer me and I needed to follow the advice of Hunter S. Thompson: "Keep moving." The only problem was that I wasn't sure how to do it. After all, transportation isn't cheap, even for a solo budget traveler. Inter-city plane fares are exorbitant, rental cars are outrageous, and taxis are prohibitively expensive. Long-haul buses are cheap, but years of riding Greyhound and Trailways put me off inter-city buses because they are barely faster than walking, and only slightly more enjoyable than dragging my nails across a car's chassis. In addition, I’m a drunk-magnet. Call me a snob if you want, but having a drunk guy breathe on me is not the kind of cultural experience I am looking for even if he does have an unusual accent. There are times I get the impression I have a flashing sign on my forehead that says, “Come, talk to me. I don’t mind.” Unfortunately, only drunks can see it. At least that’s the best I can figure because alcoholics always gravitate to me and want to share their life stories. I guess it’s a gift that keeps on giving. Like herpes. I've never been big on tour buses, either. Part of my disdain stems from a visit to Israel centering on the 22-city-in-12-day bus tour. I got more exercise getting off the bus and on the bus and off the bus and on the bus than I did at any of the sites the tour visited, because there was never enough time to walk around and see anything. No matter where the group traveled, it always stayed in Sheratons and Hiltons, which is like staying in America all over the world. In addition, I was the youngest person on that trip by at least 30 years and managed to get locked out of several hotels because I came back around 2 a.m.
Fortunately, New Zealand's hyper-organized backpacker/tourism industry has come up with the perfect solution: tour buses for independent travelers. The Kiwi Experience and the Magic Bus aren't standard tour buses, however, because they don't specialize in selling package tours. Instead, they provide basic, comfortable transportation throughout the North and South islands. They help passengers make reservations for hostels at that day's final destination, and leave the rest up to the riders themselves. Passengers pick the routes they want, pay the fare, and get on and off as they please. The tickets are good for up to six months or a year, depending on the route. Both companies may cover the same territory, but they have extremely different personalities. The Kiwi Experience was "party bus" with a younger crowd and more of a reputation for going from pub-to-pub as it rolls from town-to-town than it has for going from attraction-to-attraction. It didn't bother the passengers, though, because they all seemed to be enjoying themselves. Unfortunately, Kiwi’s buses were so full it was difficult for passengers to get back on the bus unless they had made a reservation at least 48 hours in advance. Magic appealed to a fun loving, slightly more sedate crowd. Wacky drivers and their weird stories were the best part of riding Magic. An inattentive, occasionally unresponsive front office was the worst part of the Magic experience. I still don't know why they call it the Magic Bus. It doesn't fly. The only magical thing about the bus was the way it solved my transportation problem. Magic did more than just haul me around New Zealand. It also taught me the rhythm of the road while stopping at many places I had never even heard of, and might have skipped if I hadn’t known about them: The caves at Waitomo; the glacier at Franz Joseph; and Queenstown, the adrenaline capitol of the country. The biggest drawback of the buses is they speed up and down the North and South Islands so quickly that I had trouble remembering where I'd been on any given day because the towns just rolled right on by. I had to look back at the pamphlet to remember the names of all the towns the bus visited. After all, it's not as if these are towns ripped from today's headlines. First there was Waitomo, then Rotorua, Turangi, Wellington, Nelson, Greymouth, Franz Josef, Makarora (which shouldn't be confused with the 1996 dance craze, "The Macarena") and Queenstown. The speed wasn't always a bad thing, though, because there are some towns so small "there isn't any there, there" and there never was. Waitomo is a good example. The first stop on the route, the heart of Waitomo is little more than a block long, with a dairy bar/souvenir stand at one end of the street and the Waitomo Inn at the other. In between the two are a pub, bottle shop, two places to reserve backwater innertubing tours of the Waitomo Caves and a cave museum. The museum features exhibits on the caves, the glowworms living in them and more information than I ever wanted to know about either. 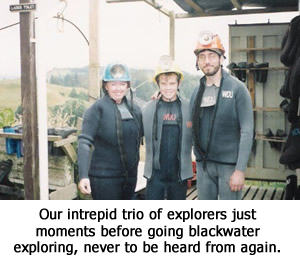 After spending half a week in Auckland, I had learned what daredevils the Kiwis were so I booked a blackwater rafting tour of a cave expecting serious fun. It seemed like a logical expectation from a country filled with building rappelling, heli-bungeeing, glacier-hiking daredevils. Besides, I had been on my first whitewater rafting trip the year before and I remembered how wild the river was, so I figured blackwater rafting had to be just as crazy but underground. I realized my preconceived notion was flawed when I noticed the only other people in my tour group were an over-excited 12 year-old boy and his unenthused 40-something mother. 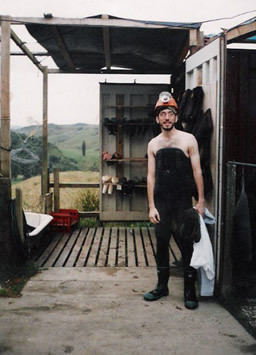 When we were fully dressed in our ill-fitting wetsuits and miners' headlamps we looked like refugees from a movie that should have been called "The Keystone Cops Go Underwater," I took one look at our group in the mirror and felt like yelling, "Houston, we have a problem." For good or ill, backwater rafting isn't quite the extreme sport I thought it would be. Instead of the underground version of shooting the rapids, it was the underground equivalent of walking through your neighborhood early on a quiet night if you live in suburbia. The activity consists of innertubing in the dark with portions of the path lit up by glowworms hanging from the cave's ceiling. Along the way, we mostly floated along on our bellies, went backward over a few small waterfalls, and spent five minutes getting lost, as we innertubed in the dark at the suggestion of our guide. The glowworms are about the only exciting part of the trip. I always thought glowworms only existed in novelty songs from the big band era. I don't know if the song was supposed to be romantic, but the worms themselves aren't. I know I'll never listen to the song the same way again now I know the critters use the lights at the end of their tails to confuse flies and other creepy crawlies into thinking they are seeing the literal light at the end of the tunnel. When the insects head toward the illumination, the worms permanently put out the lights of their victims. The trip ended with all three of us going from the cold underground caves to a hot bowl of soup and white bread. I won't lie and say the soup was bad. It was quite good, actually, but the whole adventure seems like an awful lot of trouble to go to for soup and a sandwich. At least the blackwater trip wasn't as hokey as the following day's visit to the Lady Knox Geyser. Sure, geysers are fascinating, but this one lost all charm and major style points when I saw a park employee approach the geyser's blowhole, open a paper bag and pour soap flakes into the geyser's spout. He said the seeding is the only way to make sure Lady Knox will blow on schedule. Without the precautionary measure, the explosion would occur anywhere from 10 a.m. to 2 p.m. I guess the unpredictability wouldn't be good for tourism. After all, we've got a schedule to keep here and can't wait around for nature to take its course.